As the regular season begins to crescendo, the top teams in each of the small school divisions are continuing to pull away from the rest of the pack. There was only minor shuffling in the Top 25, especially in the top 10 where the positions remained virtually the same. In these last couple of weeks eyes shouldn’t be focused so much on what teams are at the top of the rankings, but rather on those who are in the 20-25 range. A poor performance in the conference tournament by one of these schools, coupled with an upset team earning an automatic bid, could force one of these deserving teams out of the national title race. Rankings are based on games through Sunday, May 1. With a win Monday night, top-ranked Millersville completed their regular season with a 20-0 home record. The Marauders’ are now only a single victory shy of the school record, a mark that should be earned and eclipsed in the upcoming PSAC Tournament. Enough can’t be said about MU ace Brandon Miller. 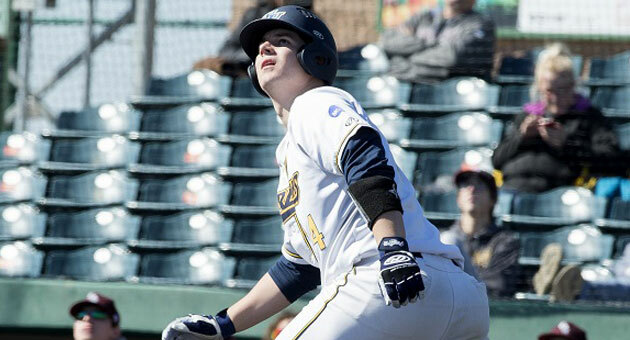 He was unquestionably poised to have a stellar spring after earning Cape Cod League all-star status last summer, but this year has gone even better than imagined. His gaudy numbers include a 1.57 ERA and .163 batting opponent’s average and get even more crazy insane if you remove one bad outing. Miller has only given up 13 total earned runs this season and six of them were in his lone loss to East Stroudsburg. If you erase that game he’s a perfect 9-0 on the year with a teeny 0.79 ERA on the season. If Coach Jon Shehan can maneuver his starting staff accordingly to have Miller available for any must-win contest, I’d put my money on the Marauders to win any game against any opponent, including many, or should I say most, D-I schools. While second-ranked and defending national champion Tampa has a team capable of reaching the D-II CWS once again, the Spartans have a extraordinary onerous road back to Cary. Currently two other Florida based clubs are in the top 10, and another is ranked 16th, each of which who have wins against UT for a total of four of their seven losses. Last week Tampa cruised to three easy wins over Pam Beach Atlantic in which they easily outscored the Sailfish 32-5. How good is the Colorado Mesa pitching this season? The Mavericks’ team ERA is a full two runs less than the next club. MSU has a team ERA of 2.63, which places them in the top five nationally. The collective ERA for their conference is 5.54. If you remove their numbers, the RMAC collective ERA jumps another half run to 6.04. The team has a pair of absolute aces in J.R. McDermott and Tanner Herdt. McDermott has a 0.92 ERA and a 7-0 clean slate while holding opposition to a .179 batting average. Herdt has stuck out more than twice as many batters as he’s given up hits to (75 to 36) in 59 2/3 inning and has four complete games. Mesa will need both of them to be at their best as they head to the postseason as the pitching rich region is shaping up to be an absolute battle. St. Edward’s, as with CMU, has spent the bulk of the season in the top 10 and the Chaparrals have been hovering around the 20 position for the past month and a half. With a roster solid offensively, pitching-wise and in the field, Minnesota Duluth was ranked 24th in the preseason, but a 2-4 start gave reason to second guess the propitious prediction. Those doubts are long gone as the Bulldogs have won 18 games in a row and have their biggest games of the season this week as they face preseason No. 1 St. Cloud State. A pair of wins over the recently struggling Huskies would all but wrap up the regular season conference title for UMD. The two game set between Minnesota Duluth and St. Cloud State will be a matchup of two of the top hitting teams in the nation as the pair are placed first and second in D-II in batting average and slugging percentage. Not only are two of the best hitting teams competing, but two of the top individual sluggers as well. Minnesota Duluth has Alex Wojciechowski who is as difficult to get out as his name is to spell. For the season the senior slugger is clubbing the ball at a .488 average, has 30 home runs and 87 RBI, and each of those numbers lead the nation. SCSU’s Reese Gregory, an All American pitcher his first three years on campus, has evolved into a fine hitter as well and is hitting .438 with 15 home runs and 15 doubles while driving in 50 runs on the season. Dropped out: Belmont Abbey (25*). The NAIA had one of the premier on-the-diamond matchups last week when top ranked Faulkner visited crosstown rival and fourth positioned Auburn Montgomery. The two avian mascoted clubs traded victories in a shortened series which allowed the Eagles to clinch the Southern States Athletic Conference regular season crown. With their win, the Eagles added AUM to their long list of ranked teams they’ve bested this season. Auburn Montgomery joins Missouri Baptist, Keiser, Davenport, Tennessee Wesleyan, William Carey and Georgia Gwinnett as schools which have been felled by Faulkner. After sneaking back into the rankings with a share of the 25th position last week, Northwestern Ohio made a move into the top 20 as they extended their winning streak to a lucky 13 games. UNOH’s resurgence has been fueled by an elite pitching staff which has dominated since mid-April. Since April 13 the Racers’ hurlers have generated five shutouts and held opposition to just a single run in another five contests. Ryan Petrangelo was arguably the WHAC’s top pitcher last season, but his pitching prowess has been surpassed by two other UNOH starters. Damon Proctor leads the club with eight wins and Jon Bobea has an inconceivable 86 strikeouts in just 52 innings. The pair have 2.39 and 1.73 ERAs respectively which lowers the team mark to a just-outside-the-top-10 mark of 2.86. The Racers picked up pace allows them to stay ahead in the rankings of conference foe Madonna who has rejoined the Top 25 after a early season dismissal. The Crusaders swept three games from previously top five Davenport to run their winning streak that rivals the length of a CVS receipt at 17 games. With UNOH, Madonna and Davenport each currently in the Top 25 it should make for a dilly of an upcoming WHAC tournament. Despite having one of the highest winning percentages in the NAIA, Jamestown fell out of the Top 25 after going 3-2 on the week. While the Jimmies still have a handsome 47-7 record overall, they’ve gone a disappointing 10-5 over their last 15 games which has included repeat losses to unassuming Mayville State and unimposing Viterbo. Jamestown has established a new school record for wins this season, but only one of them has been against a ranked opponent and all the others were against schools nowhere in the neighborhood of Top 25 consideration. Nevertheless, the Jimmies already have a berth in the NAIA national tournament secured as they were named one of the host schools. As in D-II, there is a credible threat for a player to win the triple crown. Tabor’s Manny DeLeon is currently first in the division in RBI with 94, second in home runs with 21 and is fifth in batting average at .457. With the Bluejays playing at the level of being a top 10 team the majority the season DeLeon should have good opportunity to add to his RBI and HR totals. Keeping his batting average among the leaders will be a little tricky however as Tabor’s opposition should get harder and harder as they go deeper into the postseason. Dropped out: Oklahoma Wesleyan (18), William Carey (20), Jamestown (23), Middle Georgia State (25*). Trinity, Emory and Cortland State continue to hold onto the top three spots in the D-III rankings. It would be an absolute shame if each of these teams don’t advance to Appleton and get an opportunity to face each other as one of the trio has held the No. 1 position the entire season. Trinity, the current No. 1, won their fourth consecutive Southern Collegiate Athletic Conference championship over the weekend and are headed to make their second straight trip to the D-III World Series. Emory, who hasn’t been ranked outside of the top three all season, didn’t have any games last week and won’t take to the diamond until their regional draw. Corltland, who has spent the lion’s share of the season in the driver’s seat, looks to have played their way out of the funk that ailed them a month ago and have now won 12 games in a row. Their next contest will be in the SUNYAC tournament opening round. Webster started the season ranked third nationally, but a diabolical March sent them spiraling down the rankings and out completely after their record fell to a mediocre 14-12. Since then the Gorloks have only lost a single contest, which was a 15-inning battle with 19th ranked Concordia-Chicago, a loss which was avenged later that day. With the momentum WU is back in the top 20 and could climb further toward their original slot with a strong showing to close their regular season schedule and in the SLIAC tournament. The Gorloks resurrection has been thanks in large part to the awakening for the bat of last year’s D-III home run champ, Kyle Uhrich. Uhrich has hit all 10 of his home runs this season during conference play, which is where he has also generated three-fourths of his 40 RBI. WU has a stupendous pitching staff with a top 10 team ERA, but they can’t win game by themselves. Ulrich’s presence in the middle of the lineup unquestionably makes them a tougher team and takes pressure of their strong arms and pitch comfortably. There was one matchup of top 10 teams last week as UW La Crosse hosted WIAC rival Wisconsin-Whitewater. The Eagles easily overmatched the Warhawks in the first three games of the series, outscoring their dairyland frenemy 23-3 in the first three contests. UWW rebounded to salvage the final game of the series. With the wins La Crosse moved up to fifth in the latest rankings, their highest position to-date. Whitewater in the meantime slid four sports to 11th, their lowest rank this season as they’ve gone 8-8 in their last 16 games. Although their mascot is a jumbo elephant, Tufts has quietly put together one of the best seasons in D-III. The Jumbos finished their NESCAC East schedule with a 11-1 record which allows them to host the conference championship later this month. Three of their six losses this season were by a single run and only one of their losses was an unwinable defeat. Tuft’s level of competition hasn’t exactly been murderer’s row, but their well-rounded lineup and quality pitching staff makes them a dark horse to go deep in the postseason. Plus they have a player named Boomer which I’m pretty such give them a competitive edge in a close matchup. Dropped out: Centenary (24), Rutgers-Camden (25).